Would love to hear peoples' thoughts on flipbacks, jumping off the Q&A from the June SOTT (here, if you missed it). Has anybody played with these yet? I just got a couple of the yesterday, and am actually pretty intrigued. Will be very interested to see what others think. I think it's a gimmick. paperbacks used to be about that size but they keep making them bigger. so they rotated the text 90 degrees, big deal. Watching the people read them looked like it would get uncomfortable after about 20-30 minutes. looks like they're trying to mirror the way smartphones are held and used. could be good, but long-term reading, I doubt it. catering to the ADD crowd maybe? >2 readafew: - I've actually been surprised at how comfortable they are; even turning the pages upward instead of sideways seems much more intuitive and "natural" to me than any ebook reader I've tried. And they're really small; just a touch bigger than an iPhone. It's interesting how similar in size they are to the hand-press period duodecimo format, although they're even bigger than most examples of those I have on my shelves. They're so light (4 ounce; almost a full ounce lighter than an iPhone, according to my food scale this morning) that even reading long-term with them hasn't been a problem for me (I read one for a couple hours last night and found it just as if not more comfortable than reading a regular paperback). 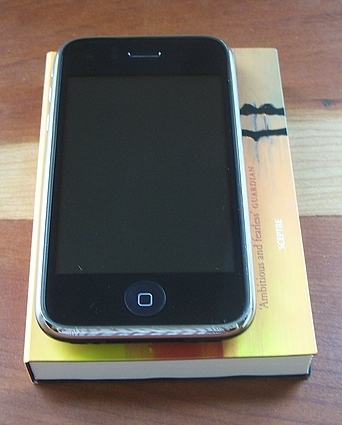 >3 Bookmarque: - I agree about the smartphone thing; it'll be interesting to see how they end up being received. It's funny to see the media calling them Kindle-killers (with the price point and the selection they seem unlikely to be that, whatever else they are). I will say that I like the binding method and tactility of them; they've done a decent job of that. I haven't had my hands on one yet, but they look like a good idea to me. Because of the longer lines of text, there would be more text in less space, not so much waste with margins, great for taking along. Now I just wonder whether or not they'll become popular here in the US. unfortunately or fortunately depending on your side of the availability, the tactile nature of these could be their downfall. If they only way you come to really appreciate them is through holding one, the dearth of bookstores could make this an issue. Meh. probably alright for some novels, but the moment you start getting into longer ones I suspect this won't work so well. Usual format change issues. You need to have a wide enough selection so that people will choose your format, but you can't do that until you have a wide enough customer base. Maybe if the next 'dan brown was only available in that format they might stand a chance. My prediction: you'll never hear of them again. >5 TooBusyReading:/8 - In the sample I have, line length is about 3.75 inches, just about the same as a standard paperback (though the margins are indeed narrower). >7 reading_fox: - Yeah, I'm curious to see what some of the longer ones look like (Cambridge UP has also published a KJV Bible in this format, but that's in two columns). They've been around in France as ".2" for a couple months now, and from what I gathered, somewhat longer in the Netherlands where the original printer (apparently branching out from Bibles) is based. They handle nicely, but not so much that I'd be willing to pay trade paperback prices for a limited subset of titles usually available as mass-market paperbacks, a format still pretty much alive and kicking around here. No, I certainly wouldn't want a book with zero margins. Margins do help in readability, but some books seem to have too much margin for the amount of text. Unless the formatting is for a specific reason, as in poetry, it seems like it's sometimes a marketing method to make books seem more substantial than they really are. As for the length of the lines, I'm sure that there is a point at which increased eye movement makes reading less effective. I'll have to see if I can find one of these books the next time I'm in a bookstore, and see for myself. Except for the different binding the format is close to the Armed Forces Editions from WWII. Just don't get it. Looks like just a sideways book to me! What's the point? And the fact that it's smaller (to be more "portable" then a regular already-easily-portable book??) is just a huge turn-off for me. I have big hands! And bad eyes. Smaller is defintely not better for me. I haven't had a chance to handle one yet, so don't know how I'll like them, but they look kind of neat. If the kind of books I read are available in that format I'd definitely try it out. I'd like to try one. The fact that, if I've understood correctly, the book falls open flat without breaking the spine and therefore means less stress on the hands (to hold book open.... as one must do with most paperbacks and, to a lesser extent, many hardbacks) that attribute might be a boon for many of us. 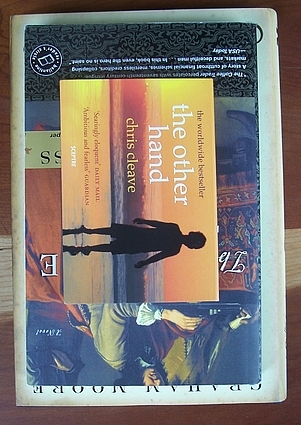 Overhere in the Netherlands this format is quite popular, especially with people who travel a lot by subway or train as it is easier to hold and read. It seems also quite handy for reading in bed. We don't call it flipbacks here, we call them dwarsliggers ^-^ Even War and Peace is published in this format! A few quick points based on nothing at all. b) I'm not sure how they will work with quicker readers. Turning the page on a flipbook looks to be more of a faff. Maybe the different movement can be learned and made as automatic as a standard book but I don't know. Lifting a page vertically seems an inherently more involved process than horizontally. c) I'm not sure how comfortable they will be to read for protracted lengths of time (an hour or more). Flipbooks look less ergonomic (arm position) for that kind of usage. Incidentally in the video one of the people had a flapping top page which would annoy me quite a bit. OK the book could be held with one hand at the top, and one at the bottom if breezy to prevent flappage - but that seems a bit unnatural. Holding a standard book in two hands (as I usually do) isn't so unnatural (at least to me) because the hands are at the same height and the arms are in a pretty neutral position. >18 andyl: a) They're printed on better quality paper than the typical MMP, much thinner and making for lighter books while retaining decent opacity & sturdiness. The font of those I saw was a bit larger than the typical MMP & more cleanly printed. >19 Jarandel: - Yes, I agree with that. The thinness of the paper definitely allows quite a bit of text (more than I expected, quite honestly). >16 Thrin: - I've found them pretty handy to read while eating, which I often try and find a pain with paperback or hardback books. These open nicely, and stay open. >17 royalhistorian: - I love the name, dwarsliggers. As I was typing the piece for SOTT, my auto-correct kept turning flipback into flapjack! Yes, whiter better paper may help readability. However if the physical dimensions - height and width - of the flipbook are significantly smaller than a paperback then it follows each page must contain less text - unless one or more of the factors I mention are also reduced significantly. Less text on the page means that the novel will have more pages in flipbook format. Whether that is enough to nullify the lower weight of the paper stock I don't know but that wasn't my main point. I do have some standard books* which I have found to be more of a pain to read than I would have liked because of typeface choice, text size, margin, and line-spacing which is why I pointed out that these factors MAY be important. I haven't held one in my hands, and nor would I judge if I had, the true test is reading an entire novel at my normal reading pace and for the amount of time that I usually read. * Most seem to be US mmpbs. I love small books - the recent trend to trade paperbacks drives me nuts. I would definitely love to try these out. I agree with #22 and would definitely try them. I wonder how long before they're available in Canada. wait so are they electronic or actual books? im confused! >24 sarahy: - They're physical books, just tiny (see the website for some background). oh ok, i understand better now. Well I'm not sure what the big deal is either but I had to find out. I live in the U.S. and they aren't supposed to be available here yet but I saw from the website that they are in the UK so I ordered one from amazon UK. There are only eleven different books available in English and nothing appealed so I ordered one I thought my daughter might like. Then 3 couples from Holland camped by me in Utah so I asked them and only one of the 6 people knew what they were. Can't wait to see for myself. Sounds to me like you can put them in you pocket which would be great in many situations. If these are indeed designed to lay flat (or be held flat) easily without spine damage then I am all for them. As it happens, one of the introductory titles is Tinker, Tailor, Soldier, Spy, which I want to re-re-re-read before the new movie this fall. At the moment I only own it in hardcover so I think I'll pay a visit to AmazonUK myself. holy moly I never thought about them making you shut them off! OUCH! So, Jeremy, where did you get them? Not in Maine? No, the publisher sent me a sample pair to use in writing the SOTT interview, and I also ordered a bunch via Amazon.co.uk. Still waiting to hear when/if/how they'll be available in the US. Jeremy what are the actual measurements of one of these? I am still picturing them as very high end versions of the old Armed Services Editions from WWII. If these get as popular as those were they will do very well. >34 TLCrawford: They're even a bit smaller than those (and of course oriented differently): Cloud Atlas is about 4.5 x 3.5 x .6 inches. This shot shows a flipback side-by-side with a standard hb and standard trade pb, and this one shows them stacked up. I think I'm going to have to go out and get hb and pb copies of a couple of the flipbacks so I can take measurements. Yes, I am that nerdy. Of course I could also just use the Amazon data, but where's the fun in that? I already had the food scale out to compare the weight of a flipback to my iPhone (flipback weighed less). Thanks - those comparisons really helped me put these in perspective - they are tiny. I can't wait to get my hands on one. I think the only issue I would have is if the font is too small for me, but I like the idea of them.